Arrived in Vegas Wed 3/24 late eve. 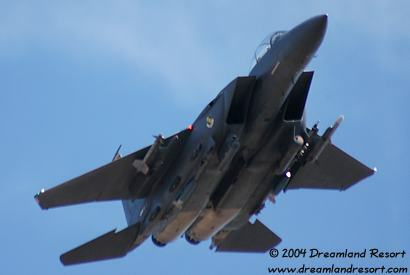 On Thur after supply shopping and a visit to the Nellis fence for a few F-15 and C-130 shots (I didn't see the prohibited signs, a car was blocking my view, honest!). From there I drove to Rachel in time for the aft flight. 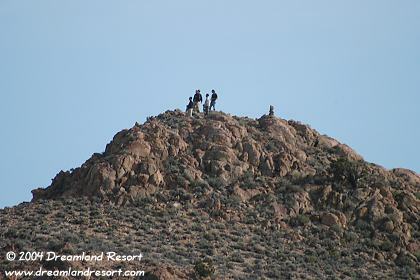 I went to Coyote and met a few of the DLR contributors but the action started so there wasn't much time to converse. A flight of Tornados came thru first followed by flights of Eagles and Falcons. At altitude where two B-52s heading west with several escorts or attackers. Several sonic booms were heard. Most of the A/C returned to Nellis via the southern route but a few came back over Coyote at altitude. 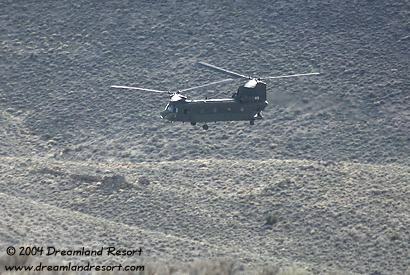 The flight on Fri aft started the same except we saw the Spanish F-18s and a pair of Chinooks passing thru the valley at very low level. Chuck got some excellent shots on Fri of all types, as did Joerg. I have watched air combat type training in this area since 1989 but this was my first Red Flag. I will make every attempt to visit as many as I can from now on. It is unforgettable seeing these aircraft performing in this mode. As always the conversations and story telling at the Aleinn are also unforgettable. It was good to see Pat, Chuck, Joerg and all my other friends in Rachel. I really missed Joe Travis, he was a big part of my trips there. I am sure the spirits of Joe and all my departed Rachel friends are still there, watching over us. 1. Join Budget Fastbreak - they have the quickest rental procedure and the best selection of vehicles in town for those of us that fly in. 2. Sahara RV motor home rentals can solve your driving and lodging planning all at once. Its not as cheap but very convenient. 3. Store N Lock on Sirius near Sahara RV has very good rates for storage closets and lockers. This would be good for us that haul a ton of stuff. I leave my camping, hiking and clothing items there for my next visit. 4. My choice for lodging in Vegas are Motel 6 near the LAS airport or the Comfort Inn on Paradise, I like the poker room at the Stardust and the Mexican restaurant at the Palm. These are my opinions, of course, I would love to hear if there are other better choices available. I have several other items that will need further research but I think will be of interest to DLR members. I will post the data.